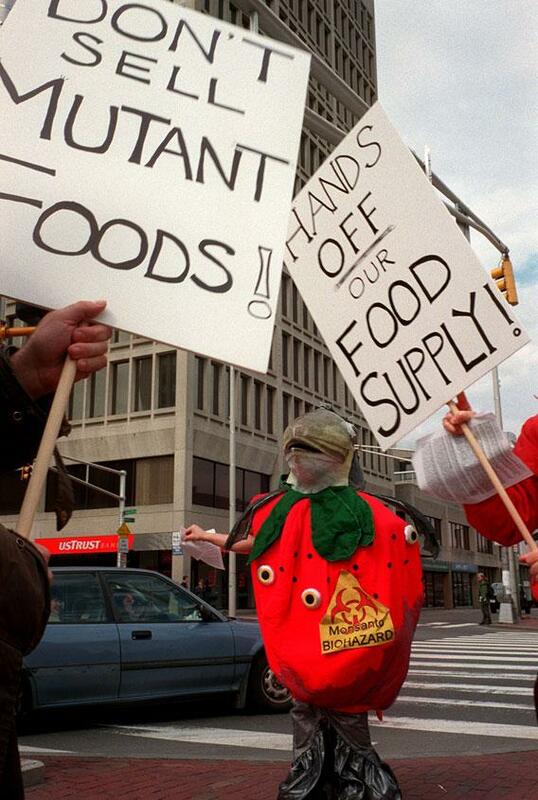 Frankenfood debate over GMOs in Europe and the United States. Photograph by Dominic Chavez/The Boston Globe via Getty Images. Read more from Slate’s special issue on the future of food. For more than a decade, Europe has faced fierce debate over genetically modified organisms—specifically, consumer crops that have had their genetic code altered in order to make them easier to farm. Self-styled environmental activists have frequently responded to GM crop trials by vandalizing or destroying them, while scare stories about “Frankenfoods” have been a regular staple of the British media diet. In the United States, meanwhile, genetically modified organisms entered the agricultural system with less protest than seen when Conan O’Brien left The Tonight Show. But two developments in the last month show that Europe may be shifting its view. And even as the European public seems increasingly inclined to accept scientific opinion on GM foods (if not actual progress in opening up markets to genetically engineered food), the United States is moving in the other direction. First, the European Food and Safety Authority rejected a French ban of genetically modified corn saying, that there was “no specific scientific evidence” of harm to humans, animals, or the environment. The EU Commission is still deciding on how to enforce the ruling, but the office of Europe’s health commissioner John Dalli said that they could now ask France to lift the ban. One week later, a group calling itself “Take the Flour Back” attempted to vandalize a publicly funded GM wheat trial in Rothamsted, England. But the plot was foiled, thanks to well-prepared police and a savvy public relations campaign by the researchers, who put out a moving YouTube plea for activists not to destroy their life’s work. In an article titled “The GM Debate Is Growing Up,” the Guardian’s environment and science editor James Randerson called the failed action a possible “turning point”: “Media reporting and comment has been mostly neutral and positive about the experiments, or actively hostile to the protesters—a far cry from the days of ‘Frankenfood’ headlines,” Randerson wrote. At the same time that the EU was declaring France’s ban to be bad science and that anti-GMO activists were being thwarted in Rothamsted, American activists were collecting enough signatures to secure a November ballot initiative. If the measure passes, California will become the first state in the union to require labels on GM foods. Judging by past polls, the referendum is likely to pass. In multiple national surveys, nine out of 10 respondents have said they were in favor of labels for genetically engineered foods, and the initiative’s sponsors say those numbers hold up in California. While the “California Right To Know” campaign may seem like an innocuous bid to give consumers more information, some scientists have voiced concern over potentially deleterious effects. Bioengineering expert Peggy Lemaux worried in an interview with NPR that the labeling initiative would frighten consumers away from perfectly healthy foods. Pamela Ronald, a University of California-Davis professor of plant pathology and co-author of Tomorrow’s Table: Organic Farming, Genetics, and the Future of Food, agrees. She told me that the initiative’s true goal “is to make consumers afraid of genetic modification and get farmers to stop using genetic modification.” Why would that be bad? Because research shows that there are significant agricultural benefits to GM foods, including decreased use of toxic insecticides, increased crop yields for some farmers, more sustainable farming practices. Further, no peer-reviewed studies have been published to support the health and environmental risks alleged by anti-GMO activists. One of the most comprehensive studies on the health risks, “A Decade of EU Funded GMO Research,” concluded that “biotechnology, and in particular GMOs, are not per se more risky than e.g. conventional plant breeding technologies.” The $425 million study included 130 research projects from more than 500 independent groups over 25 years. While there is little debate in the scientific community over the safety of the products relative to their non-modified counterparts, public opinion in Europe for years has been strongly against GMOs. European policymakers have responded to their constituents rather than their scientists, and only two GM crops have been approved for farming in EU states, while 90 have been permitted by the FDA for use in the United States. While public debates in the European Union and United States may be switching sides, their respective public policies have not yet shifted. Last year the FDA approved a new genetically modified alfalfa plant despite opposition from anti-GMO activists. In Europe, meanwhile, no new GM crop has been approved in the two years since the European Commission controversially approved a GM potato, which was not even approved for human consumption but for industrial use. While one of the historic issues that have kept GMOs out of the European Union has been protectionist concerns about large American corporations like Monsanto over-running European markets, the de facto (and sometimes explicit) bans on GM crops have actually created an environment that has stifled Europeans from developing their own competitive versions of GM products. In addition to denying farmers use of potentially cost-saving crops, the previous anti-GMO climate has produced a “brain drain” of scientists working on biotechnology in Europe. Before they start voting with their ballots and then their pocketbooks, California consumers may be wise to pay attention to that advice. Also in the special issue on food: five “food frontiers,” including technologies to make diet food tastier and fight salmonella; small-scale farmers decide whether to embrace automated agricultural equipment; and the case for bringing back home ec. This project arises from Future Tense, a joint partnership of Slate, the New America Foundation, and Arizona State University.